This product is no longer available and has been replaced by: CLIMAVUE50. 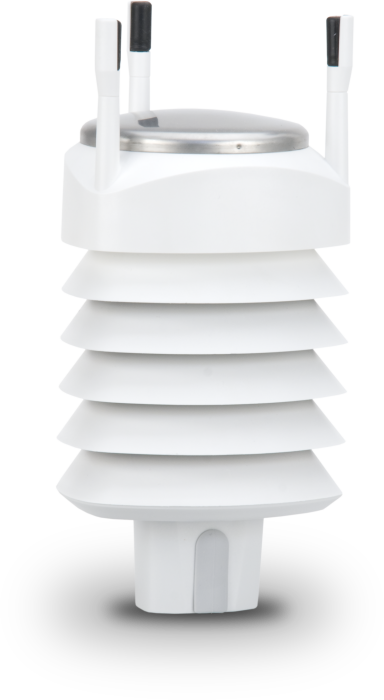 The WXT520's wind sensor consists of three equally spaced transducers that produce ultrasonic signals. Wind speed and direction are determined by measuring the time it takes for the ultrasonic signal of one transducer to travel to the other transducers. Precipitation is measured one raindrop at a time. Whenever a raindrop hits the precipitation sensor, an electrical signal is produced that is proportional to the volume of the drop. The WXT520 has a PTU module that contains a capacitive silicon BAROCAP sensor for barometric pressure measurements, a capacitive ceramic THERMOCAP sensor for air temperature measurements, and a capacitive thin film polymer HUMICAP sensor for relative humidity measurements. The PTU is housed in a naturally-aspirated radiation shield that protects it and reflects solar radiation. Below 5.3 V, the measurement performance for high wind speeds may be degraded. The WXT520 is shipped with a mounting tube. The mounting tube fastens to a CM202, CM204, or CM206 crossarm via the CM220 Right Angle Mounting Bracket or 17953 1-in x 1-in NU-RAIL Fitting. The 25299 is an optional mounting kit for the WXT520. It provides better water protection. When using the 25299, the WXT520’s IP classification is IP66; otherwise its classification is IP65. The 25299 fastens to a crossarm via the CM220 bracket or 17953 NU-RAIL fitting. The 25300 Bird Spike Kit is used to discourage birds from roosting on the WXT520. This kit is fastened on top of the WXT520. It consists of a metallic band with spikes pointing upward. The spike’s shape and location ensure minimal interference of wind and rain measurements. The spikes are designed not to hurt the birds. Please note that when the kit is attached to the WXT520, more snow can accumulate on the WXT520, and the snow may melt slower. Why do the values from the WXT520 seem to be out of order? Campbell Scientific only supports using the WXT520 configured to our factory default settings. Other settings may produce data values that are different than the ones assumed in the provided example programs. Why do the example programs for the WXT520 use a scan rate of 5 seconds? The example programs use a scan rate of 5 seconds to coincide with the internal update rate of 5 seconds. This update interval is preconfigured at Campbell Scientific for air temperature, relative humidity, and barometric pressure measurements. If the wind speed on the WXT520 constantly reads 0, what should be done? The unit needs to be sent to Vaisala for repair.